Developments such as the increasing globalisation of the food industry, new technologies and products, and changes in the susceptibility of populations to disease, have all highlighted the problem of emerging pathogens. Pathogens may be defined as emerging in a number of ways. They can be newly-discovered, linked for the first time to disease in humans or to a particular food. A pathogen may also be defined as emerging when significant new strains emerge from an existing pathogen, or if the incidence of a pathogen increases dramatically. This important book discusses some of the major emerging pathogens and how they can be identified, tracked and controlled so that they do not pose a risk to consumers. 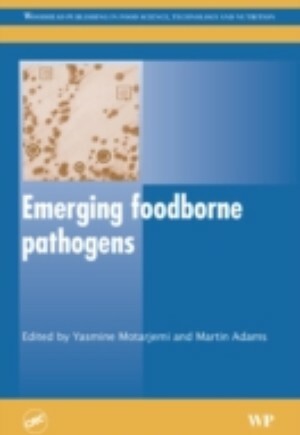 After an introductory chapter, Emerging foodborne pathogens is split into two parts. The first part deals with how pathogens evolve, surveillance methods in the USA and Europe, risk assessment techniques and the use of food safety objectives. The second part of the book looks at individual pathogens, their characteristics, methods of detection and methods of control. These include: Arcobacter; Campylobacter; Trematodes and helminths; emerging strains of E. coli; Hepatitis viruses; Prion diseases; Vibrios; Yersinia; Listeria; Helicobacter pylori; Enterobacteriaceae; Campylobacter; Mycobacterium paratuberculosis; and enterocci. Emerging foodborne pathogens is a standard reference for microbiologists and QA staff in the food industry, and food safety scientists working in governments and the research community. Part 1 Identification issues: How bacterial pathogens evolve; Surveillance for emerging pathogens in the United States; Surveillance of emerging pathogens in Europe; Tracking emerging pathogens: the case of noroviruses; Industrial food microbiology and emerging foodborne pathogens; Microbiological risk assessment for emerging pathogens; The role of food safety objectives in dealing with emerging pathogens. Part 2 Individual pathogens: Acrobacter; Foodborne trematodes and helminths; Emerging strains of E.coli; Hepatitis viruses; Prion diseases; Vibrios; Yersinia enterocolitica; Helicobacter pylori; Enterobacteriaceae; Campylobacter; Mycobacterium paratuberculosis; Enterocci.